Aside from The Intellectual Farmer being "very cheap," the brothers claim that their agricultural publication "has many of the best agricultural writers" and has valuable hints about "farming, gardening or fruit growing." The publication is produced in hopes that farmers will find success in their honorable field of work--no pun intended. The boys even reach out to their readers and ask them to provide helpful farming tips for others to benefit from, strengthening the bond shared within the farming community. This second "April" issue claims to be from both Goshen and the fictional "Farmingtown" and includes crop information from farms on the brothers' imaginary continents. 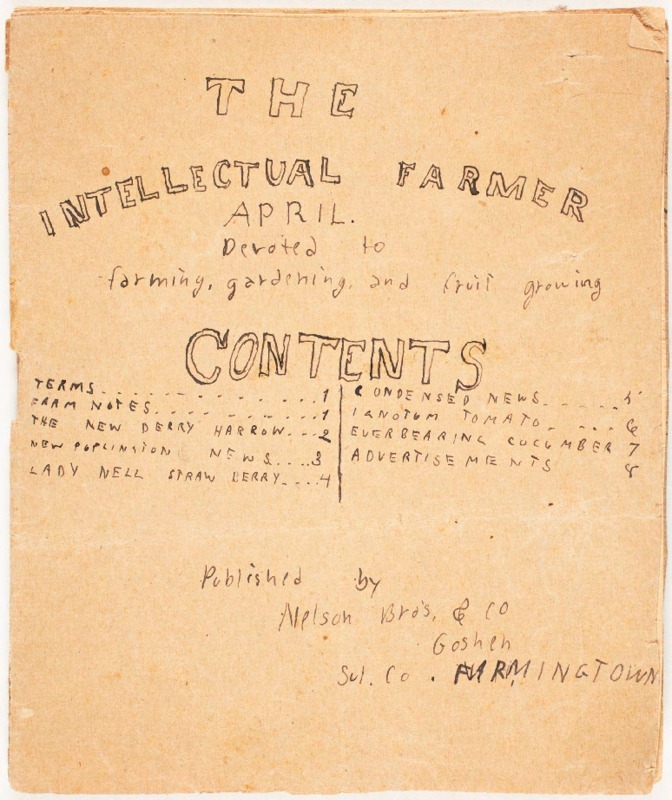 “The Intellectual Farmer (April),” The Worlds and Works of the Nelson Brothers, accessed April 23, 2019, https://www.ats.amherst.edu/childhood/items/show/531.